"This morning we installed three new members," said the Cerritos Optimist Club. Those are always such wonderful words to hear! New members bring new enthusiasm, new perspectives, and new ideas to the club so that it can reach out and serve the community in more ways than ever before. The new Cerritos Optimist Club members are shown here in the front row: Dr. Dina Lew, Dr. Carol Hansen, and James Watson. Congratulations and welcome to the family. It's a new week! And it is a grand time to promote more of what Optimist Clubs do to make your community a better place to live. In Blair, Nebraska, the Optimist Club is planning two events for this weekend. Both are worthy of notice. 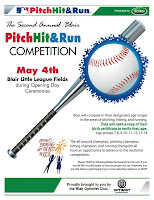 On Saturday, May 4, 2013, the Blair Optimist Club will host the 2nd Annual Pitch, Hit & Run Competition. 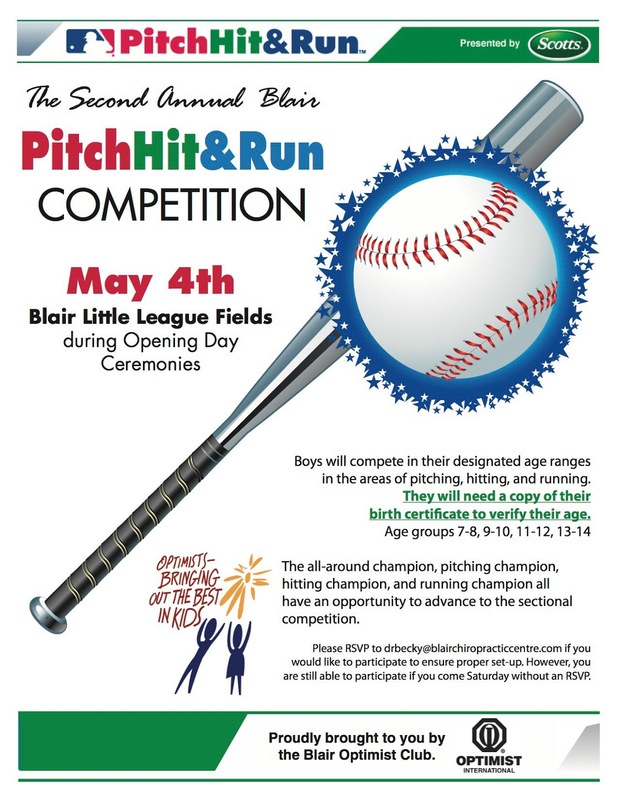 It takes place on Little League Opening Day at the Blair Little League Fields. How's that for awesome cooperation between organizations? 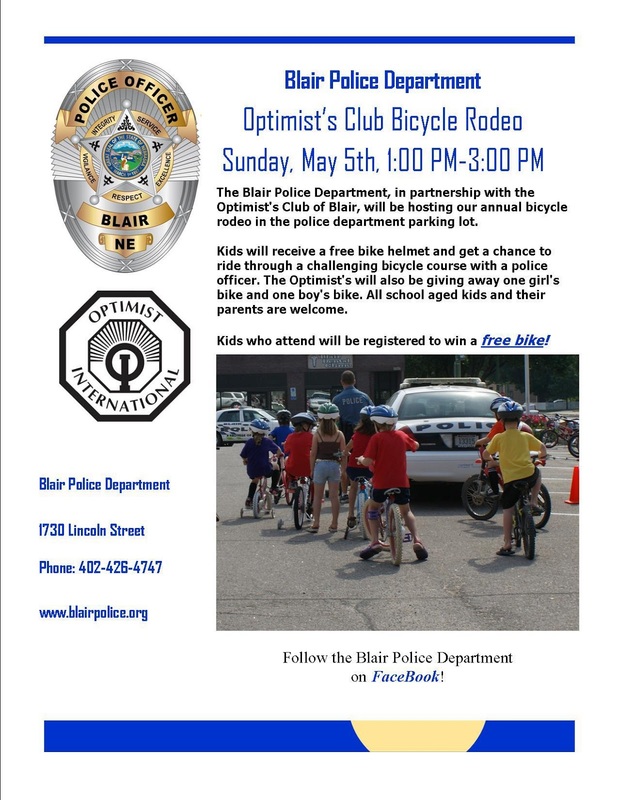 The second event allows the Blair Optimist Club to collaborate with the Blair Police Department as they host a Bicycle Rodeo on Sunday, May 5, 2013. The kids get free helmets and a bike safety check-up, and they ride through a challenging obstacle course designed to help them learn the rules of the road. 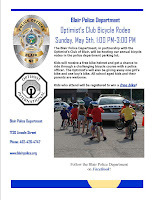 Plus, all kids are entered to win a bicycle. Optimist Clubs serve many needs in our communities. 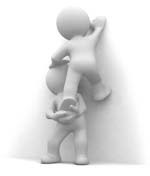 Working with other organizations makes the experience that much richer for all. Great job, Blair Optimist Club! Please click on the photos to enlarge and download the flyers. Optimist International has three scholarship programs in which Optimist Clubs can participate by sponsoring a club level contest. The winners from the club level contest then move forward to a zone, regional, and/or district level competition where the winning student is awarded a $2,500 college scholarship. Funded through the Optimist International Foundation, Optimist Clubs annually award more than $150,000. I'd say that is pretty awesome. However, many Optimist Clubs choose not to host the Optimist International Oratorical Contest, Essay Contest or Communications Contest for the Deaf and Hard of Hearing. They say they have trouble reaching students. The challenge is both physical and mental. Often a club has difficulty navigating through the school district protocol and mentally, inspiring a 15-year old to write an essay when they might be doing, well, anything else, is not always an easy task. I want to take just a moment here to applaud the Optimist Clubs that do succeed in hosting these great events. By helping students develop their communications skills, you are helping in many ways that will benefit them throughout their lives. Learning to express ourselves, and to lift our voices appropriately and respectfully, makes for happier personal and professional relationships. You are helping children reach their full potential. The important thing is that you never give up. Students need this activity and when they visit your club to make their presentations, your club will find it even more rewarding than the students. I promise. 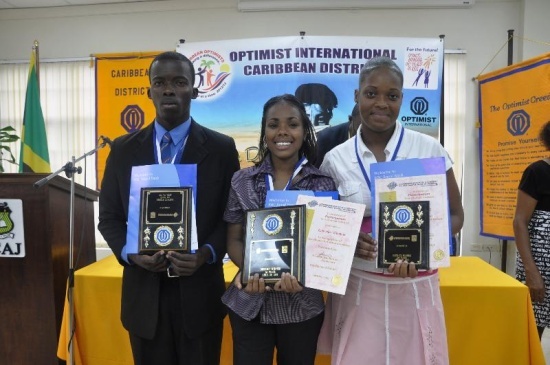 (top) Caribbean District - Optimist International shared this photo of their CCDHH winners. (bottom) Cape Gazette - The Optimist Club of Salisbury, MD shared this photo of their Oratorical Contest winners. If you would like to see more winning photos, please visit the Experience Optimism Optimist International Scholarship Contestants board on Pinterest. "When I look at the world, I am pessimistic, but when I look at people I am optimistic." The surreal lockdown of Boston on April 19, 2013, left even optimists wondering about their faith in humanity. Special kudos must go to the townspeople, the government entities and businesses that complied with the Governor's request that people stay home while the manhunt for the individuals suspected of the Boston Marathon bombing was carried out; and special thanks to the law enforcement officers at all levels that brought the Boston Marathon bombers to justice. With one dead and one apprehended, we may never know what led the two young men to hate their fellow human beings enough to cause them harm. Over the next months we will hear of faith-driven motives and political differences, and probably about teenage angst, mental incompetency, and any number of other possible reasons that terrorists strike. We need to be especially careful at this time to pay attention to our youth. They are little sponges that see and hear what is going on in the world around them and react in a variety of ways. As adults, we must reassure them that sometimes bad people do bad things, but the world is a good place to be. Finally, help children know what to do in the unlikely event something were to happen close to them. FEMA has prepared suggestions for a Family Emergency Plan for explosions, bomb threats, and suspicious packages and letters. Some might think introducing these tools to young children will cause anxiety of its own, but I believe it is a reassuring step that lets the child know that plans for her safety have been thought out in advance. For children, or for anyone, there is comfort in knowing that in crisis situations, someone will be thinking specifically of them. 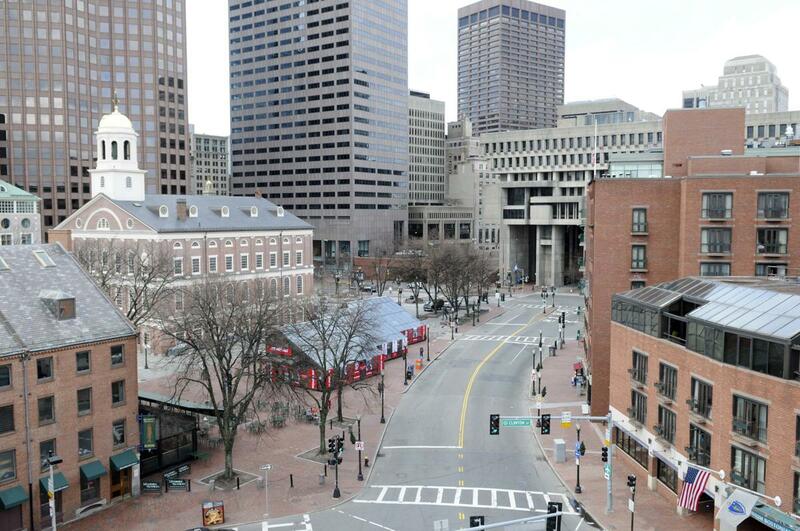 Photo credit: North Street at Faneuil Hall from www.boston.com, Neal Hamberg/Reuters. On April 1, 2013, Optimist International shared on its Twitter feed that April was Optimist International Internet Safety Month. "Play a role in keeping youth and teens safe while online," it said as it provided a link to the page on the Optimist International website that describes the Internet Safety Program. And that was the last I heard of that subject; however, it didn't occur to me again until last night that I hadn't heard of a single Optimist Club that was conducting an internet safety program. I find that sad for a number of reasons. First, I'm a little disappointed that it wasn't on my mind. Internet safety, especially in light of bullying tactics that teens perpetrate on one another, should be on everyone's mind. We have to do all that we can to be sure that youths, young adults, and others feel safe, and are safe, when they use online media. But I'm also sad to see that Optimist International hasn't followed up to encourage Optimist Clubs to participate. To be fair, there was a notice sent to members in an "Executive Update" message and the fact that it was Internet Safety Month was posted on the organization's Facebook page; but posting notices doesn't encourage participation. That only provides information. Where's the encouragement to make sure it happens? Internet safety is a broad topic that can be addressed from a number of different levels. Optimist Clubs and their members can be involved from teaching young ones not to share information online, and to know that not everyone online is their friend, to helping teens make good decisions about online sharing. They might even teach seniors and their peers how to avoid identity theft or give them tips about online etiquette. I know I have a few Facebook friends that could certainly use the latter. There are plenty of angles that Optimist Clubs can use to promote internet safety. I hope that more are inspired to do so. Soon. Activities that get children outside and moving are really popular right now, partly because springtime makes us want to get active. But they are also popular because of the obesity epidemic that is threatening our country. Optimist Club members know that bringing out the best in children requires helping them to be healthy as well. So over the past few weeks, I've seen a number of tri-star sports activities sponsored by Optimist Clubs. Tri-star sports encourages kids to do three activities in a sport. For instance, for baseball, young athletes would pitch, hit and run, and I was especially excited today to learn about the Redland Optimist Club Games. The games are series of track and field events for special needs children. Each year, more than 200 elementary, middle school and high school students participate. Following the games, a healthy lunch is served. 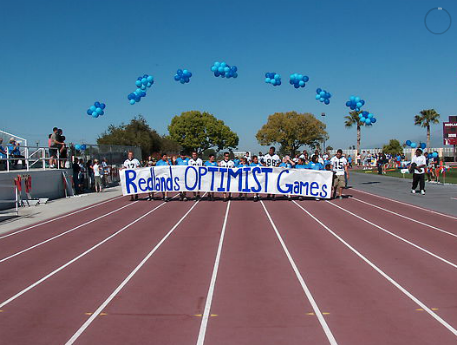 The Optimist Games, sponsored by the Redland Optimist Club has been held annually for 27 years. 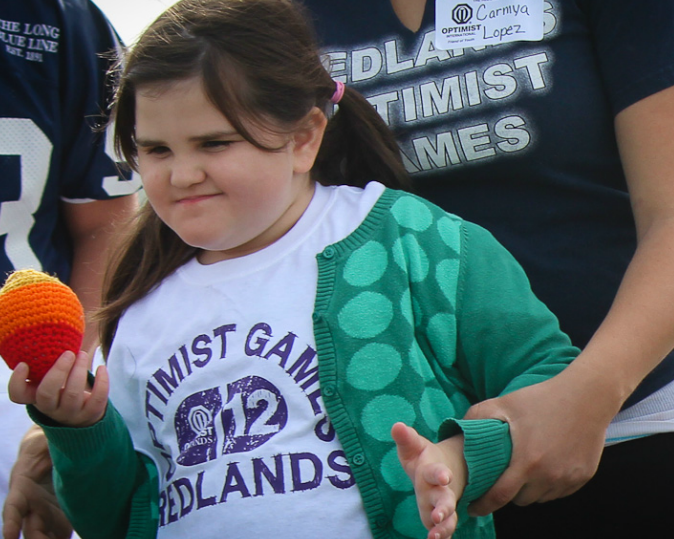 This year they received help from University of Redlands students, Redlands High School girls soccer team, and the Octagon Clubs from Redlands High School and Citrus Valley High School. 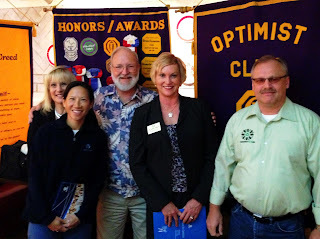 Thanks to the Redlands Optimist Club, Redlands, CA, for sharing the story and pictures. The tragedy that befell the Newtown, CT community on December 14, 2012 gave President Barack Obama an event to move forward important measures to promote gun reform laws in the US. I live in Idaho where the mention of gun reform turns ordinarily civil people into raging fanatics against the government as they fear control of what they believe is a constitutional right. Never mind that the US Constitution also promises to protect all of its citizens from harm. President Obama generally gives a weekly address to his constituents and the world; but not this week. On April 13, he has given his time to Francine Wheeler, a mother whose six-year-old son, Ben, was murdered at Sandy Hook Elementary School. President Obama thought what she has to say was important to the cause and so do I. But even more, I also think that her point of view is optimistic. And staying optimistic about our great world is what Experience Optimism is all about. Please watch and then do something about gun violence. Add your voice to a unified call for action. Thank you. One of my favorite activities that I've seen an Optimist Club do this year just got better. On March 27, 2013, the Caribbean District - Optimist International celebrated Proud to be an Optimist day. The Pacific Northwest District followed suit. The key method of sharing information about Optimist pride was Facebook and Twitter where members proclaimed their association with their Optimist Club and explained why it was important. 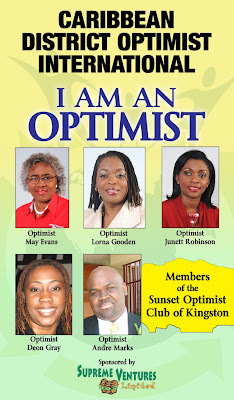 Today I saw the poster created by the Sunset Optimist Club of Kingston for the event on Facebook and got all excited about the promotion once again. It's so simple, even you can do it for your Optimist Club! Ask five or six members to share their pictures and their names to the cause and then create a poster of your own. Share the poster on Facebook, take out an advertisement in the local paper, and post it on bulletin boards about town. Don't forget to add your contact information - people will want to associate with your club! 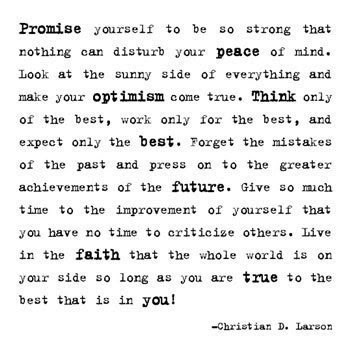 I'm proud to be an Optimist. Are you? "member at large" category of membership. It has been suggested as an amendment to the organization's bylaws to be reviewed and voted on by members who attend the Optimist International Convention in July, 2013. As written, the member at large option would allow an individual to bypass an Optimist Club and associate directly with Optimist International. It has been pointed out that this might violate its charter within the constraints of Missouri law, where the organization is officially incorporated and headquartered. Knowing that this option has been proposed and rejected before, I immediately assumed that this conflict with regulation has conceivably been resolved. From my viewpoint, however, the legal process is not the issue. The issue is that those in leadership positions would even consider abandoning the club model in order to focus on individual memberships. I've said it before and I will say it again, individuals belong to Optimist Clubs and Optimist Clubs belong to Optimist International. The traditional service club model may seem old-fashioned to the millennial generation. It may even seem old-fashioned to baby boomers and those outside or in-between, but that does not mean that the club model is dead. It simply means that Optimist Clubs and our perception of Optimist Clubs needs to evolve. But in order to evolve, there must be a foundation that does not tilt with every passing wind. Optimist International must first and foremost establish its unique value proposition and that includes making the case to individuals of the importance of being involved with a local club. 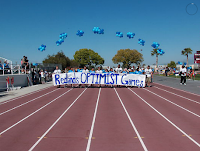 Optimist Clubs can then run with the theme to do remarkable things in their communities. Over the past ten years or so, the organization has struggled to determine what it stands for. Some thought it might be the eradication of childhood cancers and the Cure Childhood Cancer Campaign was established. Some thought it might be Optimist Junior Golf Championships and the golf tournament broke away from the Junior World of Golf and grew in its own right. Still even others thought it was simply to bring out the best in kids and they began promoting a mission so broad that nothing differentiates it from other organizations, schools, groups, and countless others who work for children's causes. 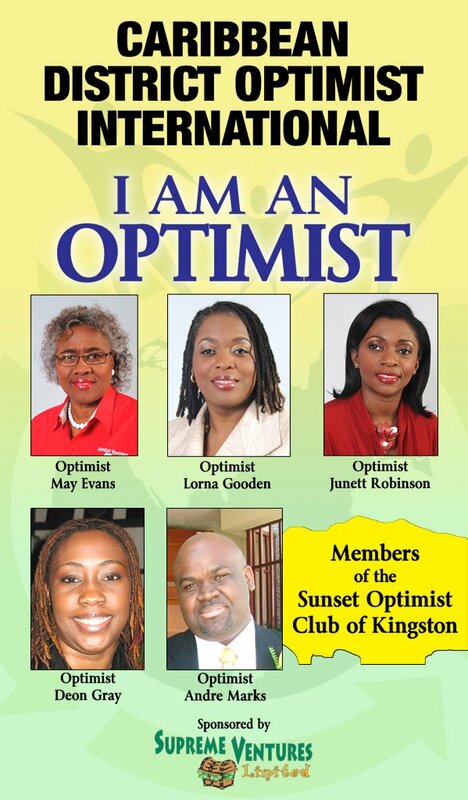 "Using the philosophy of the Optimist Creed, Optimist Clubs make positive changes in their communities. Optimist International provides resources to help Optimist Clubs effectively manage their time and the impact of their community service projects." Optimist International needs to get out of the leadership business and make itself a resource to its clubs instead of individual people. With more resources, like grant opportunities, event planning ideas and marketing and promotional tools, among others, clubs would have the opportunity to evolve in a meaningful way. As Optimist Clubs evolve, Optimist International will prosper, but it is incumbent upon the organization to lift its clubs up. It must ask its clubs what they need and then do their best to respond. Most of all, I believe that Optimist International must stop trying to recruit members for themselves. I can't think of a bigger competitor for Optimist Clubs than the umbrella organization to which they all belong. Today's choice for Music Sunday at Experience Optimism comes by way of a Facebook friend. I saw the post, clicked on the link, and voila, I decided to share it too. I'm not familiar with the show that the clip comes from, "The Yellow Magic Show," but apparently there is quite a following for this Japanese duo, Haruomi Hoson & Miharu Koshi, and the "Yellow Magic Orchestra," that includes them and others. The group's roots were in electronic music equipment such as synthesizers, but this clip is acoustic. I found it charming. Such a happy song belongs here at Experience Optimism because sometimes we don't need to know the why in order to find it enjoyable. I hope you enjoy "Good Morning Mr Echo" and find it charming too. 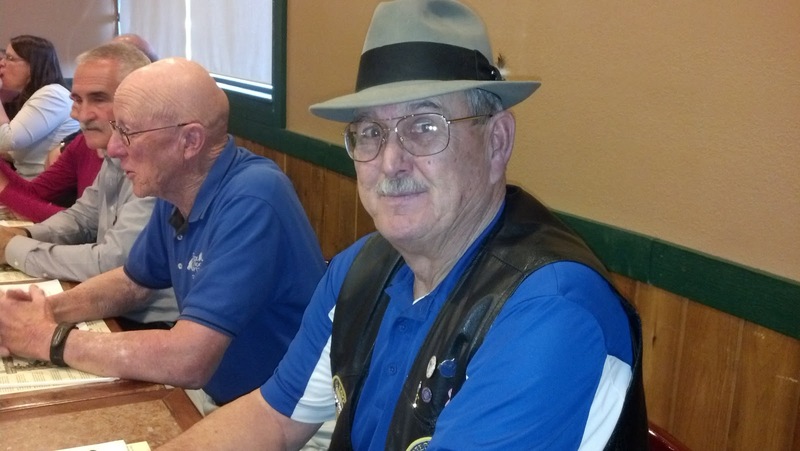 At the Boise Noon Optimist Club evening meeting this week, Larry Highley (right) announced that he was running for club president. That was quite welcome news for a club that has been twisting arms to get members to step into leadership roles. You see, the Boise Noon Optimist Club has been suffering from membership problems of late. Not that all service clubs don't experience attendance and participation issues, but the Boise Noon Club's are just a little bit different. About 12 years ago, the Boise Noon Optimist Club partnered with the City of Boise to develop the Optimist Youth Sports Complex. It seemed like a great idea and with a growing population in Boise, more and more kids would soon be going through their popular football program as players or cheerleaders. What happened is the Optimist Club became developers, fundraisers, coaches, facility maintenance workers, and concessionaires of a vibrant city park instead of being an Optimist Club. Wow! Some might say, what a great problem to have! But for some, that level of commitment and involvement became tantamount to having a second job. For others, the coaches especially, the commitment began and ended with the twelve weeks they devoted to the football program each year. They didn't share the ongoing, year-round commitment that the Optimist Club members owned. Signing the coaches on as Optimist Club members didn't help and while the club averaged membership levels of approximately 280 people for at least 8 years, less than 15 members would regularly attend meetings. Those 15 were getting quite a workout, tending to fields and facilities, and recruiting volunteers to staff the concession stands and other spots needed to run a sports facility. They would try valiantly to host other programs and have been successful in maintaining a relationship with Mountain States Tumor Institute (MSTI) at St. Luke's Hospital as part of the Childhood Cancer Campaign, but other programs fell by the wayside. There wasn't enough manpower to do it all. To right-size their club, they dropped most of those football coaches last year and now sport only 76 members on the roster; but recruiting more members has been a tough sell for this Optimist Club. The successful football program is well known and people very often say, "My kids aren't in football; I'm not interested," or "No thanks, I don't want to be involved with a football program." Unfortunately, the club has put itself in a position that it can't say, "But we do so much more!" This is an example of when success doesn't always equal growth. Now back to Larry. Larry is one of the regular 15 members that attends most meetings, fundraisers and football games. He came to Boise from an Optimist Club in Missouri several years ago and hadn't wanted to step up to lead because he has already been there and done that. But he knew that something had to give or the Boise Noon Optimist Club would wither away. His election will usher in a new era. I predict that the Boise Noon Optimist Club will soon be the sponsor of Boise Optimist Football and that they will hire people to run the program and facilities. As an experienced association manager, let me say, that is how it should be. Volunteers are great. I love to volunteer; but sometimes, professional management is needed to take a group to the next level. Good luck, Larry. I hope you achieve your goals. 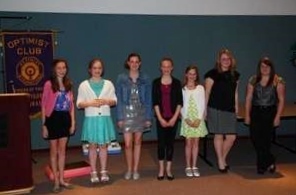 The Optimist Club of Windsor, Colorado recently hosted its Annual Oratorical Contest. In promoting the contest, it focused on the activity being the oldest and most well-known program for Optimist International. This year's topic, "Why My Voice is Important," allows students to think, write, and share their ideas in a critical way. These are common impressions of our young participants after one witnesses an Optimist Oratorical Contest. Communication is so important and today, when so much communicating takes place online and in writing, it is important that the art of delivering a speech and connecting with people in a live forum does not disappear. As Optimist Club members, we must work to ensure that doesn't happen. 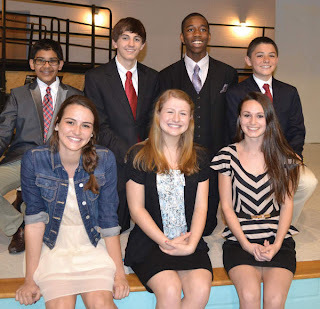 If your club does not host the Optimist International Oratorical Contest, it should. Read up now on how to do it and be sure that the students in your community have every opportunity to participate. Photo courtesy of Sandi Squicquero and the Windsor Optimist Club. Twelve students participated in the club contest, seven girls and 5 boys. The photo shows the girls division. I manage Facebook pages for several different Optimist Clubs as well as the page for the Pacific Northwest District - Optimist International. I like to change the cover photo at least once a month with a new line from the Optimist Creed. Sometime last year, Optimist International created cover photos for Optimist Clubs to use. There is an album available on its Facebook page with the 10 popular tenets in English and French. I thank them for that; but I'd also like to make a recommendation. It's time to update them! Yes, some are cuter or more inspirational than others and those get more play on Facebook and other social media channels. I've included my personal favorite here. But we could vary our message and reach more diverse audiences if we had even more to choose from. Yes, I could make some cover photos myself, but this is one area of support that I believe Optimist International should be willing to provide as it can be done with little expense or trouble. Optimist International? Are you listening? Optimist Clubs want to tell the Optimist story, but they could use a little professional help in the graphic design area. Thank you.